TS151515-75 1/2" x 1/2"x 1/2"
TS202015-75 3/4" x 3/4" x 1/2"
TS323232-75 1 1/4" x 1 1/4" x 1 1/4"
TS323225-75 1 1/4" x 1 1/4 " x 1"
All fittings are available in either SI or 100 formats. 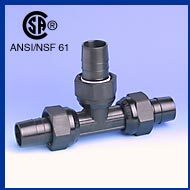 SI fittings are designed to connect to standard grade 75psi, 100psi & CSA grade 75psi poly-pipe. 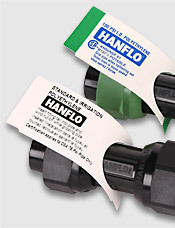 100 fittings are designed to connect to 100psi CSA grade poly-pipe. Common Applications Include Farms, Pressure Lines, Irrigation, Wells, Water Systems, Sewage & Effluent, Sprinkler Systems, Green Houses, Horticulture, Agriculture. Each fitting is tagged and colour coded to eliminate error in product selection.